On my way home last night, motoring the red Jeep down Ohio Rt 53, out in the middle of nowhere, only a bunch of farm fields, oncoming traffic and darkness, I saw a bright flash of light in my left eye. I realized, with a familiar guilty pleasure that a death, and an opportunity to observe bizarre evidence of an incredible natural phenomenon had occurred. A Firefly had crashed into the proverbial windshield on the freeway. My proverbial windshield. I find it hard to believe I have only seen this happen a few times, but now I look forward to it! If you have ever noticed what happens when a firefly hits your windshield on a dark night, you know it glows for a long time – like 15 minutes! When I was teaching Bio 101, I added a “back theme” of bioluminescence to the standard Kingdoms of Life survey-of-living-things. I have found this survey to be an often unsatisfying section in most Biology courses. It is difficult to show students “every living thing,” living. Bioluminescence was one interesting way to compare unique adaptations between Kingdoms. **Do you know which of the five major Kingdoms doesn’t have a bioluminescent organism in it? Schools and biological supply companies try – the Intro Lab at the small liberal arts college I was at had an ancient collection of specimens of soft-bodied marine animals like anemones, sea cucumbers and jellyfish (I know, not fish), in the back room in big cabinets. They looked like baby food jars with pee and a sandwich bag in them! Very unsatisfying! Fortunately, one year I was teaching this class, the New England Aquarium in Boston had a big temporary exhibit on Sea Jellies (you know, jellyfish). We made a big field trip and it was a beautiful exhibit and an awesome field trip. And a bonus to the Sea Jellies was a nice exhibit of “Flashlight Fish” (in the Fish Family, Anomalopidae). We had just learned about these fish in our “back theme content” of bioluminescence. 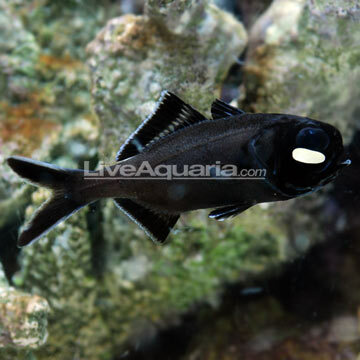 Flashlight Fish are in the Kingdom Animalia, obviously, but they aren’t actually bioluminescent themselves. They have ‘pouches’ under their eyes in which they maintain colonies of bioluminescent Bacteria (Kingdom Monera). Most bioluminescent organisms (meaning they produce their own light) use the same protein/enzyme complex (enzymes help break down proteins, in this case to release energy in the form of light). The common bioluminescent protein is called Luciferin (proteins often end in “in”). And the enzyme is called Liciferase (enzymes usually end in “ase”). The fairly basic cells of the Bacteria in Flashlight Fish lights don’t have a nucleus or other cell organs and cannot control when they are glowing. Their DNA has a code to make Luciferin and Luciferase all the time. So if they’re alive, they glow. But the fish can turn their lights on and off - it looks like they’re blinking - by either rotating the pouches back in their heads or closing a flap over the light, depending on the species of Flashlight Fish (this symbiotic relationship seems to have evolved more than once in similar, but different ways). It’s thought the fish use their lights to communicate, perhaps in courtship, to see food and maybe to startle predators. In the New England Aquarium exhibit, you walk into a dark side room and there is a large tank in front of you – and you can hardly see anything – except paired, bluish-glowing crescents flashing on and off in the water – beautiful! It looks like they’re wearing superhero masks! The Kingdom Fungi has a few bioluminescent representatives. Some of you may be familiar with, or have even observed Foxfire (it can be any of a number of different species, but in the lab we looked at Armillaria mellea). This Fungus makes a greenish-bluish, glowing mass along some forest floors. In A. mellea the growing mycelium (Fungus body) glows. Its name, reminiscent of armor, refers to a hard shell-like covering over the older fungal bodies, so the mature Fungus does not glow. But if these guys are growing, they’re glowing! There are also various species of mushrooms that glow. The amazing scenes in the ants’ nest in A Bug’s Life (Pixar 1998) were lighted with cute little green-glowing mushrooms along the walkways – it looked like cute, little poetic license on Pixar’s part. But actually, they nailed it (Pixar never really did the poetic license stuff anyway)! There are mushrooms in Nature that look just like that! The Kingdom Protista also includes a number of lighted species. In some marine habitats, there are planktonic (floating) Protozoans that, when agitated, spit out little globs of bioluminescent stuff. If you remember Dory, (coincidentally another of Pixar’s memorable characters) from Finding Nemo (2003), she would be totally distracted by little globs of glowing lights in the water! So are many predators and this gives a small window for escape for these tiny, mostly defenseless animal-like things. Many marine boaters have seen this shimmering glow in their wakes at night. And the Kingdom Anamalia has plenty of bioluminescence. Plenty. Many deep-water marine Fish, Jellies, Arthropods. Squids and other weird things have a wide array of colored displays that they use for a wide array of who knows why! As researchers are able to better observe the deep ocean, and technology gets more capable, more and more of these cool beasts are being discovered! Among the Arthropods, there is a small marine Crustacean that lives in the Sea of Japan called Cypridina hilgendorfii that emits a blue glow. Dried samples were supplied to soldiers in the field during WWII. The soldiers would crush the dried shells, add water, and a pale light would be produced that wasn’t easy for the enemy to detect but was actually bright enough to read by! When a female Firefly sees the right guy flashing, she flashes back with a pattern he recognizes as coming from a kindred spirit. So, he flashes back a little more vigorously while flying toward her. She responds in kind and the intensity of their call and response picks up until she is just pretty much lit up for him to see his landing spot! Then they mate. Charming, right? But the best part of this cautionary tale is that they also get important, defensive chemicals from the duped suitors. After they eat three or more of the right species of suckers they have chemical protection against bird and spider predators! Fireflies also use Luciferin and Luciferase, but are unique in the world of bioluminescence in that they break down the ubiquitous energy-storing molecule ATP (Adenosine Triphosphate) to get energy for their light. They make an extremely efficient light. This means the energy given off is almost completely in the form of light energy and almost no heat is given off. A Firefly glows for so long when it smashes into your windshield because the chemical reaction that produces the light is “oxygen limited.” A limiting factor is the least available thing a reaction needs in order to run. When a Firefly wants to make its light come on, it mixes the Luciferin, Luciferase and ATP together in the light chamber in its abdomen. But nothing happens because the reaction needs oxygen to run. So the Firefly opens its breathing holes (spiracles) to flood the chambers with oxygen. It controls the duration of the flash by closing its spiracles. You can see the light fade, instead of snap off, as it consumes the remaining oxygen. Clearly, when you are barreling down the highway, oxygen is not limited! So the smashed Firefly’s light-producing chemical reaction continues to run until the next limiting factor is used up. The splat will glow until the Luciferin, Luciferase or ATP is used up. I don’t know which one it is, but with plenty of oxygen, they have enough of the other chemicals to glow for 15 minutes or more! This leaves only the Kingdom Plantae with (to my knowledge) no bioluminescent species. Is this an evolutionary oversight? Is there some conflict between photosynthesis and bioluminescence? Are plants just too good to glow? ... enter Technology and the Tinkering of Humans! One possible application for this would be to splice the Firefly DNA into the region of the Tobacco genome that was activated when the plant was being attacked. Plants are well known to redistribute their internal chemistry to defend themselves when under attack by herbivores. They can move to areas being nibbled various latex-like substances that gum up the herbivore’s mouthparts or tannins which are believed to be bitter tasting. And if they will glow in only the areas they are getting chewed on, pesticide application can be much more targeted. Just walk around the field at night with a little spray bottle and look for glowing leaves! There are now many applications for which this natural chemistry is used, including tracing cancerous cells as they develop in Humans! Last year I saw a *student* project at the Ohio State High School Science Fair that employed this technique to learn about the genesis of certain cancers! What will we think of next! Genesis, from The Lamb Lies Down on Broadway (1974).